Thinking of going freelance? Start here. About two years ago, I left my job at a tech startup to become an independent marketing consultant. Since then, many people have asked me how one “goes freelance.” The good news is that it’s not as difficult as you may think. That said, it’s also not as simple as putting your two weeks in, kicking up your feet, and waiting for the clients go come knocking. There has never been a better time to pursue an independent career path. In fact, there are more than 55 million so-called freelancers in the US alone, and this number is on the rise thanks to the proliferation of distributed organizations and flexible work lifestyles. As it turns out, employers are warming up to the idea of hiring against shifting needs and capitalizing on the inherent perks of building a more flexible workforce. If you’re considering making a move or stand at the precipice of your own independent career, make sure you take the necessary steps to safeguard your finances and get your business plan in order before ever taking on that first project. Here’s a quick-and-dirty guide. The second you become freelance, you should stop thinking of yourself as an individual and start treating yourself as you would a business. This mentality shift is critical. So you’re a business. Now what? Successful businesses have one thing in common: They create value for their customers. Value might be driven by an existing need or through innovation that creates an entirely new need (e.g. Apple and the iPhone). Before quitting your 9-to-5, plot out the specific value you will provide to your eventual customers. Is there a whitespace when it comes to vendors providing this kind of value? Do you offer a differentiated approach that might make you more appealing to customers? The candid way to look at it is this: Just because you want to be selling your service independently, does not mean there’s a market for it. Make sure that what you intend to sell is something that people want or need. If you’re looking to go the created value route, recalling the iPhone example above, keep in mind that this is a much more challenging journey, as it will involve convincing people that a) they need your type of service and b) that your specific service is the right choice for them. The next piece of advice can be a disappointing bit of news for people who are ready to go freelance right now. Quitting a full-time job to build your own business will involve some financial sacrifices in the upfront, with the overall setup costs varying by industry. Regardless of your area of work, however, the irregular payment cycles of a freelance business—especially during the first few months—will require you to build a financial safety net so you can live your life uninterrupted as your business takes off. Consider a designer who decides to leave her agency to start her own visual branding studio. At her agency, she likely receives two scheduled paychecks a month, in addition to health coverage and other benefits. The day she quits that job, the paychecks and the health coverage stop. And even if she picks up clients not long after going solo, she will likely wait one month or more until she sees payment on those projects (net-30 is the standard for most contract work). Meanwhile, her normal living costs continue and now she must pick up her own insurance, which can cost $500/month or more. Given the delays caused by finding freelance work and then getting paid for that work, new-to-the-game freelancers should aim to save at least two to three months’ worth of living costs (including the cost of health coverage and anticipated business setup costs, such as buying a domain or joining a co-working space) before resigning. I’ve spoken to many people who want to go freelance, but have yet to carve out a well-articulated positioning statement for their independent business. Going back to the first step, if you’ve already confirmed that there is a market fit for what you will be doing, there will inevitably be competition. How will you stand out to win over customers? An easy mistake is to be too broad with your service offerings, following the logic that the more fluid and far-reaching your services span, the more potential clients you will have. It’s okay to offer a variety services, most freelancers do, but your story should be tight when it comes to your approach and the types of clients you take on. A bit of a personal anecdote: When I was starting out, I made the mistake of branding myself as a marketing generalist. This led to customers being confused about my specific area of expertise and also caused me to take on work that wasn’t the right fit for what I really wanted to be doing, which was partnering with startups on their early positioning and go-to-market strategy. When I “rebranded” myself as a resource for startups in particular, with an emphasis on communications and content, I experienced an uptick in those types of clients. As it turns out, people want to work with people who want to work with them , and whose talents will benefit them directly. It’s that simple. A big question first-time freelancers will ask me is “how much should I charge?” This will vary depending on the type of service you sell and the market you’re working within. That said, there are some universal best practices to keep in mind while establishing a pricing structure. Break the project down into smaller parts and define how long (how many hours) it will take you to complete each item on the list. This is a scope breakdown, and it should include anticipated revision cycles as well as completion of the original tasks. Add up the total number of hours and multiply by your hourly rate. For some advice on how to determine what that is for a given project, consult this guide. One thing to keep in mind is that as a freelancer, you can change your rate within a range based on the specific tasks involved. For example, I charge differently for a simple copywriting assignment than I would a more strategic positioning project. Share your scope breakdown with clients to give context and provide transparency. The benefit of doing this is that it provides flexibility and negotiation leverage. There have been times when customers have indicated that a scope I provided is beyond their budget, but based on the breakdown I provided, we were able to eliminate items (AKA free up some of my time) to get the total closer to budget. While estimating your time is important, another piece of advice I got early on is to estimate scope hours based on the average time it would for someone with similar skills. If you happen to be a very quick coder who can wrap a project in 30 percent less time than your peers, you shouldn’t charge 30 percent less. Of course, it goes without saying that the quality of your output should be 100 percent (or more) of what is asked of you, regardless of how long it takes. Oh, and one more thing about scope proposals: After both parties agree to the terms, the immediate next step is to create a contract that appends these terms as a statement-of-work (SOW). You can use this freelance contract wizard from the Freelancers Union and AND CO to build your own. 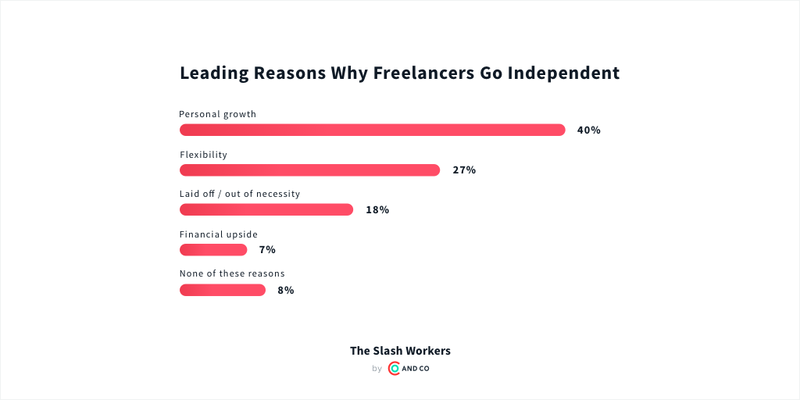 Freelancers go independent because they love what they do and they want to take more ownership of their professional careers. That’s great! But what many people don’t realize is that when you launch your own business, the necessary tasks related to operating your company can take away from time spent on billable work. All of these little tasks, such as following up on invoices and tracking expenses, can add up to hours of time spent over the course of a month, causing fatigue and even negatively impacting your bottom line. The good news is that we live in a golden age of technology, and solutions exist to help self-employed people run their businesses with little to no accounting experience. The app I used at the start of my freelance career, AND CO from Fiverr, is the one I use to this day—and full-disclosure, they eventually even became a client of mine. What I love about AND CO at the beginning was that it forced me to think of everything I was doing through the lens of a business-owner. Here’s a good checklist to keep handy as your business takes off. Set up a business checking and credit card account on Day 1. This will make it easy to keep your business income and expenses separate from your personal accounts. With AND CO, I can sync my business account to the app and file away expenses as I go, saving me hours when it comes to tallying up my deductions ahead of tax payments. Automate your invoicing (and invoice follow-up) process. Most freelancers juggle multiple projects and clients at once. With staggered start and end dates, it can be difficult to remember who owes you how much and by when. Apps like AND CO make this easy by auto-generating templates and sending follow-up reminders. File your expenses as they are incurred. Some freelancers make the mistake of waiting until the end of a quarter or calendar year to go through all of their finances and add up their deductions. This can take hours, if not days, of your time and will also cause you to forget expenses you might have incurred. Use an app that tracks your expenses over time so that you can quickly tag them as you go. At the end of the quarter, you can then revisit the totals en masse to take advantage of important freelance deductions. Beyond these steps, you will need to consider other things, like branding and business development, to take your freelance business to the next level. For those just starting out, however, these five steps are absolutely critical to starting on sound financial footing and making a good first impression with early clients. If you’re looking for more tips, check out AND CO from Fiverr’s free e-book on the subject, called Hacking Independence.